As promised back in December, Samsung has started to roll out the Android Jelly Bean update and a host of 'Premium Suite' features for owners of the original Galaxy Note. The Korean manufacturer is gradually furnishing the 5.3-inch smartphone/tablet device with the update, with immediate availability depending on region and mobile network. The update brings early phablet adopters the chance to parade the newest Android and Samsung-made features alongside those Johnny-come-lately Galaxy Note 2 owners. Android 4.1 obviously brings the awesome Google Now app into play, while a host of Samsung Premium Suite features are also piggy-backing along for the ride. Original Galaxy Note owners will get the neat Multi Window functionality, which allows users to use two apps simultaneously (i.e. sending an email and watching a video) without switching screens. It also brings Page Buddy, which launches a window featuring relevant apps when a user, for example, pops out the S-Pen or plugs in headphones. There's also a customisable notifications panel and the Smart Rotation feature that also proved popular on the Galaxy Note 2. It's little surprise that Samsung has furnished the device with the update. 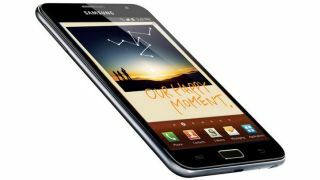 The Galaxy Note was insanely popular and proved a lot of people wrong with its stellar sales performance. The update, when it hits your part of town, will be available to download over-the-air or using Samsung's Kies desktop software.